Should I even get an implant? Should I Wear Medical ID? 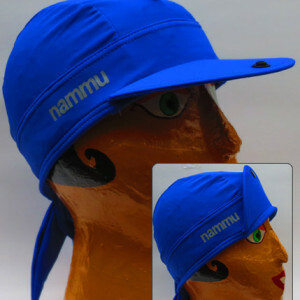 Nammu Hats has just released a new version of the famous Nammu Hat with a sun visor. Now you can clip your a Neptune processor to the hat, or tuck a processor in a waterproof bag beneath it, and be secure in protecting your processor and your vision at the same time! Here’s how to swim with your processor using a Nammu hat. And for our readers, enter discount code CochlearImplantHELP when placing an order with Nammu Hats until June 20th to receive a 25% discount! Nammu has announced a color-of-the-week campaign. Each week a color is chosen for sale at half price! Wait for your favorite color to come around, and stock up! This week’s color is purple. Use the Nammu Swim Hat to go swimming with your cochlear implant processor! The Aqua Accessory from Cochlear, and the aLOKSAK bag from, well, LOKSAK, are waterproof bags that can protect your BTE cochlear implant processor from water damage. Unfortunately, the bags can come off pretty easily if you jump in the pool or do just about anything at a water park. The Nammu Swim Hat is a stylish way to secure your processor to your head. Our resourceful friend Ben demonstrates how to use the Nammu Swim Hat. The Nammu Hat is comfortable! It’s easy to put on, and doesn’t tug at your hair when you take it off. While the Aqua Accessory is designed to sit on your ear, it can be rotated up so that it is completely under the Nammu Hat. Just make sure to keep the headpiece magnet in the correct location. This prevents water from getting underneath it and pulling the whole assembly off. The aLOKSAK bag doesn’t sit on your ear at all, so it has to go under the Nammu Swim Hat. The hats used in the video were generously provided by Nammu. Many thanks to the Leventhal-Sidman JCC for the use of the pool to create the video.